The Clorox Company (NYSE:CLX) investors should be aware of an increase in support from the world’s most elite money managers recently. CLX was in 28 hedge funds’ portfolios at the end of December. 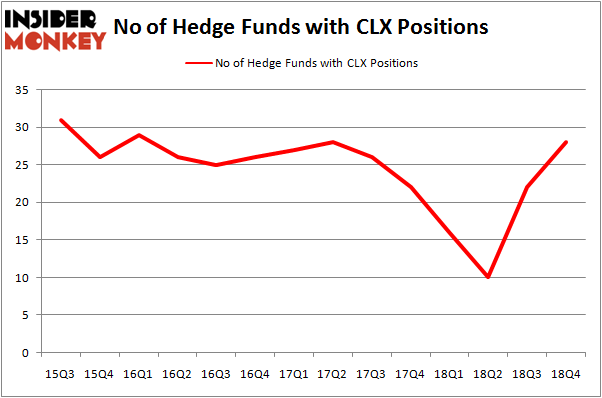 There were 22 hedge funds in our database with CLX holdings at the end of the previous quarter. Our calculations also showed that CLX isn’t among the 30 most popular stocks among hedge funds. In the 21st century investor’s toolkit there are a multitude of indicators investors put to use to size up publicly traded companies. A couple of the most useful indicators are hedge fund and insider trading signals. We have shown that, historically, those who follow the top picks of the elite investment managers can outclass the broader indices by a solid amount (see the details here). We’re going to take a glance at the recent hedge fund action regarding The Clorox Company (NYSE:CLX). Heading into the first quarter of 2019, a total of 28 of the hedge funds tracked by Insider Monkey were long this stock, a change of 27% from the previous quarter. The graph below displays the number of hedge funds with bullish position in CLX over the last 14 quarters. With hedge funds’ positions undergoing their usual ebb and flow, there exists an “upper tier” of noteworthy hedge fund managers who were increasing their stakes substantially (or already accumulated large positions). According to Insider Monkey’s hedge fund database, Cedar Rock Capital, managed by Andy Brown, holds the biggest position in The Clorox Company (NYSE:CLX). Cedar Rock Capital has a $444.5 million position in the stock, comprising 11.9% of its 13F portfolio. On Cedar Rock Capital’s heels is Renaissance Technologies, led by Jim Simons, holding a $359.5 million position; the fund has 0.4% of its 13F portfolio invested in the stock. 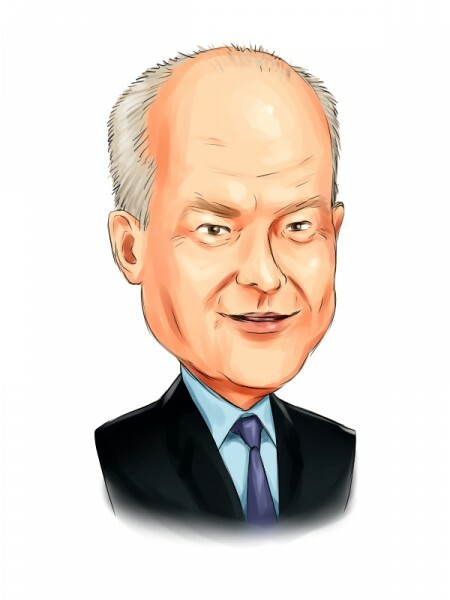 Remaining peers that are bullish encompass Cliff Asness’s AQR Capital Management, Ken Griffin’s Citadel Investment Group and Phill Gross and Robert Atchinson’s Adage Capital Management. Consequently, specific money managers have been driving this bullishness. Carlson Capital, managed by Clint Carlson, established the most valuable position in The Clorox Company (NYSE:CLX). Carlson Capital had $18.5 million invested in the company at the end of the quarter. Paul Marshall and Ian Wace’s Marshall Wace LLP also initiated a $2.8 million position during the quarter. The other funds with new positions in the stock are Claes Fornell’s CSat Investment Advisory, Minhua Zhang’s Weld Capital Management, and Dmitry Balyasny’s Balyasny Asset Management. Let’s now review hedge fund activity in other stocks similar to The Clorox Company (NYSE:CLX). These stocks are Waste Connections, Inc. (NYSE:WCN), Tyson Foods, Inc. (NYSE:TSN), FirstEnergy Corp. (NYSE:FE), and Korea Electric Power Corporation (NYSE:KEP). All of these stocks’ market caps are similar to CLX’s market cap. As you can see these stocks had an average of 28.5 hedge funds with bullish positions and the average amount invested in these stocks was $1470 million. That figure was $1027 million in CLX’s case. FirstEnergy Corp. (NYSE:FE) is the most popular stock in this table. On the other hand Korea Electric Power Corporation (NYSE:KEP) is the least popular one with only 9 bullish hedge fund positions. The Clorox Company (NYSE:CLX) is not the least popular stock in this group but hedge fund interest is still below average. This is a slightly negative signal and we’d rather spend our time researching stocks that hedge funds are piling on. Our calculations showed that top 15 most popular stocks among hedge funds returned 19.7% through March 15th and outperformed the S&P 500 ETF (SPY) by 6.6 percentage points. Unfortunately CLX wasn’t in this group. Hedge funds that bet on CLX were disappointed as the stock returned 4.9% and underperformed the market. If you are interested in investing in large cap stocks, you should check out the top 15 hedge fund stocks as 13 of these outperformed the market.